For God to resort to violence in order to save the world is not saving the world; it’s condemning the world. But John tells us, “Indeed, God did not send the Son into the world to condemn the world, but in order that the world might be saved through him.” God saves the world not through the impatience of violence but through the infinite patience of divine love. 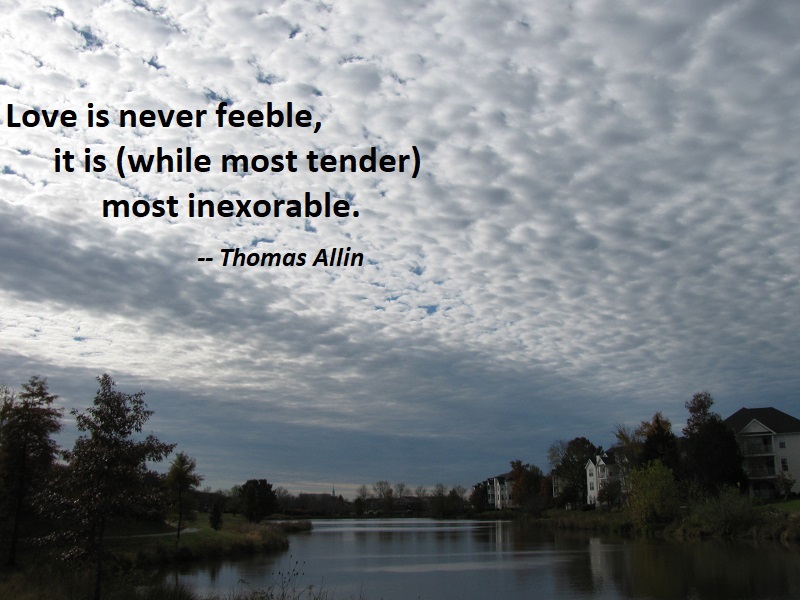 I understand the incredulity of unbelievers toward the idea that the world can be saved by love and without violence; it is this very incredulity that lies at the foundation of their unbelief. But it is the very inconceivability of God-saving love in Christ that Christians are to believe in most of all. If John 3:16 is to mean anything, it must mean that God gets what God wants through love, or not at all. 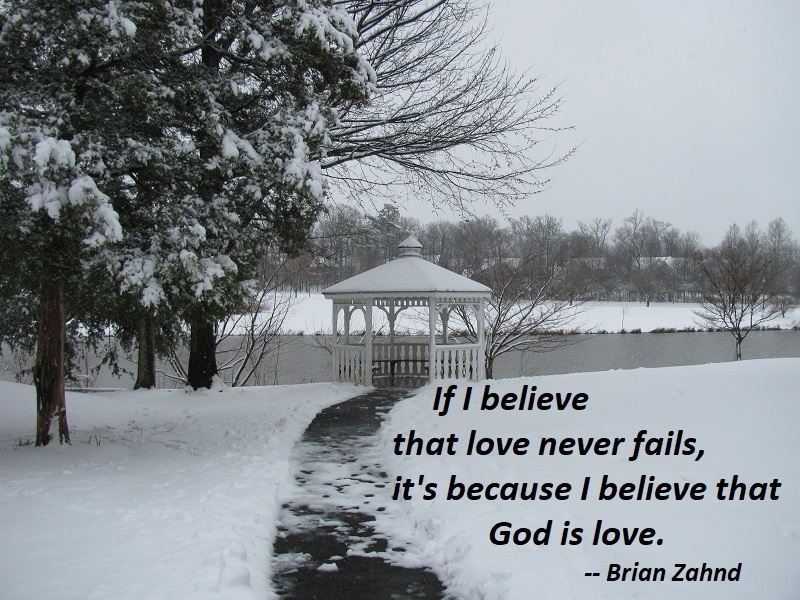 If I believe that love never fails, it’s because I believe that God is love. 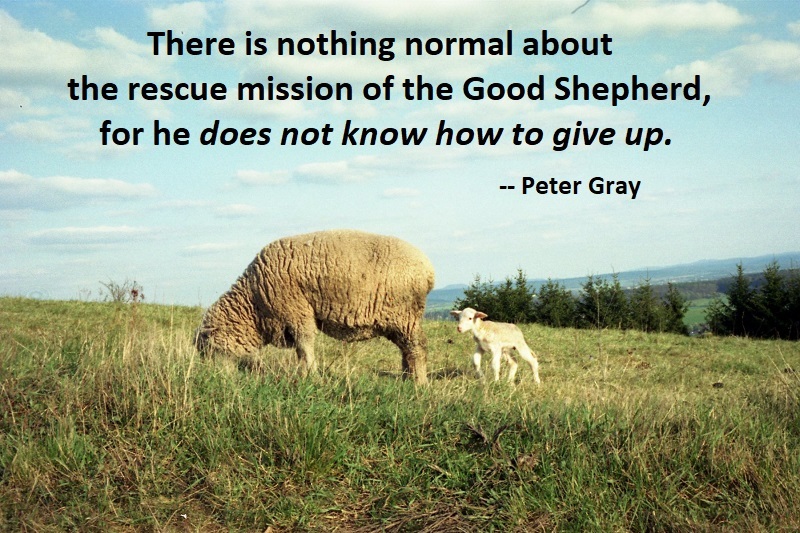 To believe in the sufficiency of God’s love to save the world is not naïve optimism; it’s Christianity. — Brian Zahnd, Sinners in the Hands of a Loving God, p. 206-207. According to the traditionalists, God’s holiness lies in God’s right to retributively punish sin forever out of being offended by human sin. However, Jesus defined God’s holy perfection much differently. He didn’t describe God’s holiness as God’s need to restore his offended majesty, but rather he explicitly and clearly defined God’s holiness as God’s unbounded love for God’s enemies (Matt 5:43-48). Remember, it was the Pharisees who defined God’s holiness in terms of separation from sinners. The Pharisees (whose name means “separate ones”) excluded sinners from their fellowship because they believed they were imitating the way God relates to sinners. Jesus, on the other hand, welcomed sinners into fellowship with himself because he believed he was imitating the way God relates to sinners. 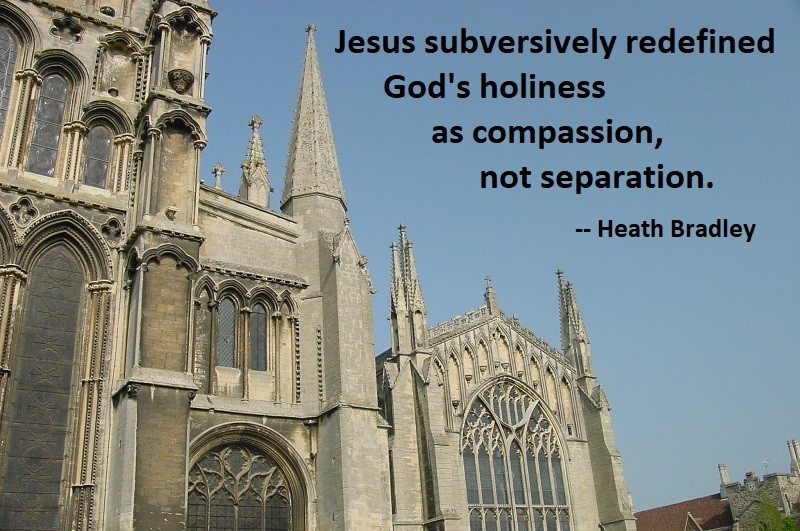 Jesus subversively redefined God’s holiness as compassion, not separation. When thinking about the holiness of God, it is crucially important that we let Jesus define divine holiness for us, since he is the pinnacle of God’s revelation to us. “No one has ever seen God,” the apostle John writes, but Jesus “who is close to the Father’s heart has made him known” (John 1:18). God is holy, to be sure, but traditional defenders of hell rely far too much on the vision of divine holiness put forth by the Pharisees, and not enough on the way Jesus revealed the holiness of God as compassionate love. In the New Testament, however, salvation is about much more than just getting our soul into heaven when we die, and evangelism is about much more than getting our name on the right side of the divine ledger. 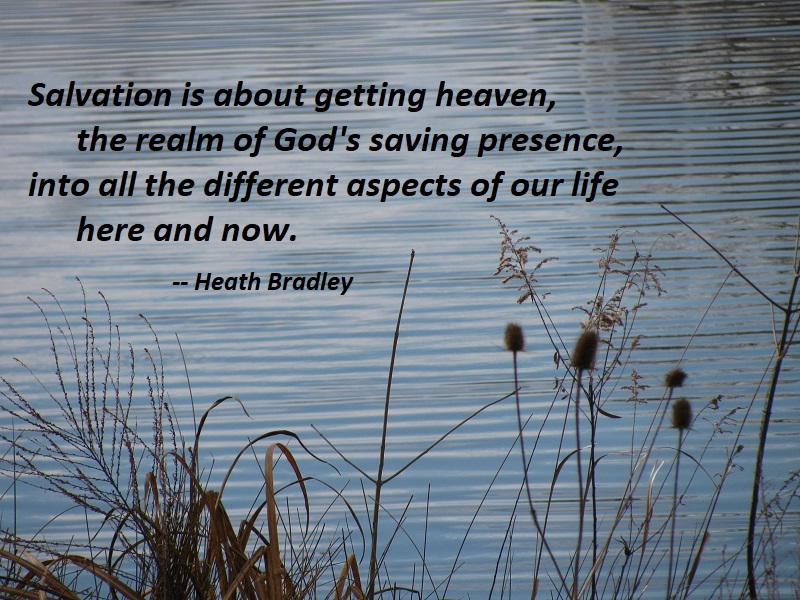 Salvation is about getting heaven, the realm of God’s saving presence, into all the different aspects of our life here and now. The early Christians did not understand their mission in life to be to simply get people to assent to certain religious beliefs so that they would have a good afterlife waiting for them. They believed that Jesus is the world’s true ruler, and so their mission was to live in that truth and announce it to the world. The first Christians believed that through his resurrection and ascension, Jesus was exalted as King over all, and so the way we enable God’s kingdom to come on earth as it is in heaven is by following Jesus here and now. Jesus once told a story about three people who encountered a beaten and battered man on the side of the road (Luke 10:29-37). The first two had all the right religious beliefs, and indeed were official representatives of their biblical religion. The third man was a heretic, from the perspective of the first two men. The first two men passed by without helping. The third man went out of his way to help the stranger, and this is the man Jesus held up as the model for what God asks of us. 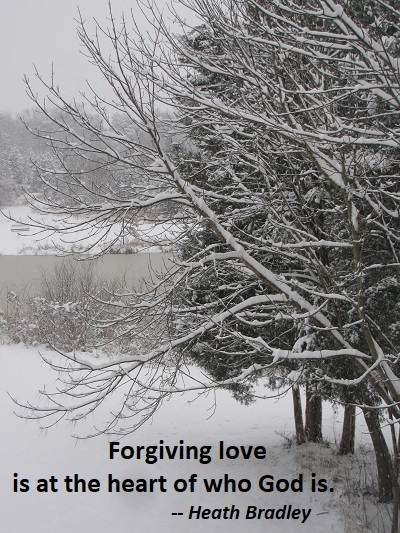 It’s a haunting and powerful story that challenges the way in which we want to make being right with God about something as easy as believing the right creed or engaging in the right religious ritual, rather than accepting the challenge of letting divine compassion fill our hearts until they overflow with action. 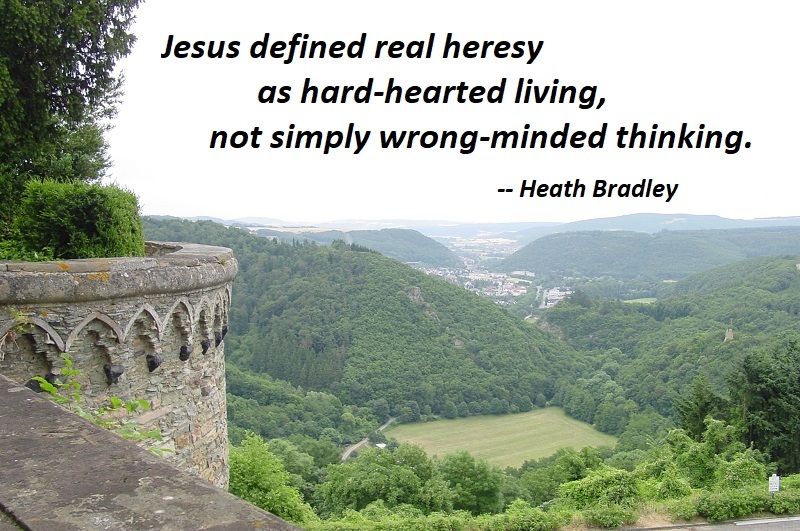 Jesus defined real heresy as hard-hearted living, not simply wrong-minded thinking. Inclusivism strikes me as the theological option that is most open to making room for this central insight of Jesus. On this view, what matters most is actually walking the Way of Jesus; the Way of unlimited forgiveness, unbounded compassion, restorative justice, and nonjudgmental truth-telling. People from a variety of religious perspectives, or no particular religious perspective at all, can walk on this Way of life that Jesus incarnated. We can be assured that when we walk this Way, it will lead us directly into the heart of God (whether that is our goal or not). Perhaps, with this in mind, John 14:6 isn’t a harsh threat at all. What if Jesus meant it as an assuring promise? When we follow “the Way, the Truth, and the Life” that he fully embodied, we can be assured that we are walking the path to God. I plead for the acceptance of the larger hope, as taught by so many in primitive days (a fact fully proved); a hope, that it has ever been the purpose of “our Father” to save all his human children. To believe or to hope for less than this would be, not alone to contradict Scripture, as I have tried to show, but to mistake its whole scope and purpose. 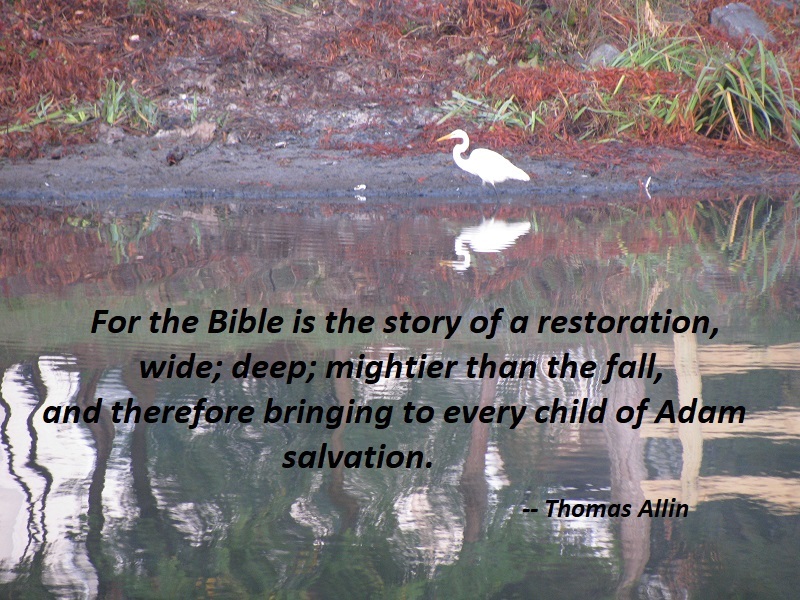 For the Bible is the story of a restoration, wide; deep; mightier than the fall, and therefore bringing to every child of Adam salvation. It is not, as the popular creed teaches, the self-contradictory story of one almighty to save, and yet not, in fact, saving those for whom he died. It is the story of infinite love seeking “till it find”; a love that never fails, never, though heaven and earth pass away: a love that is, from its very nature, inextinguishable — being the love of a divine Father. 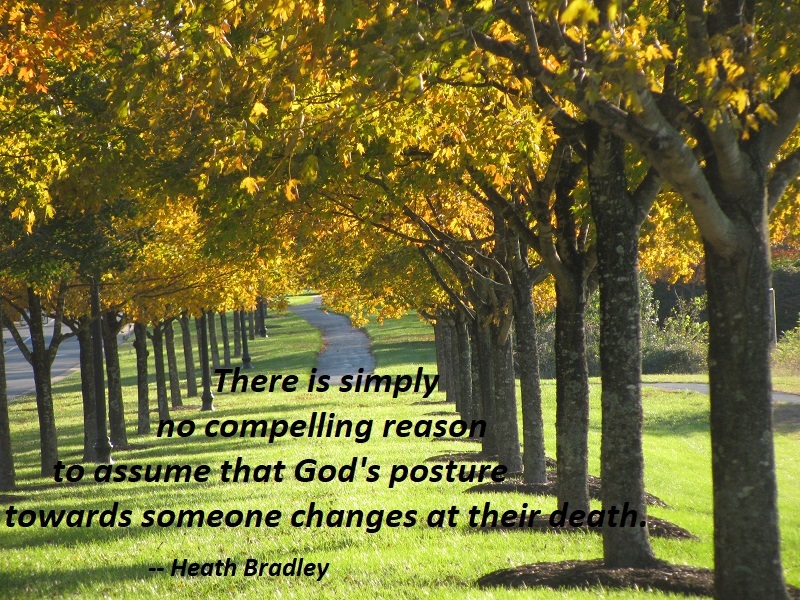 It is the story of the unchanging purpose of the unchanging Lord God Omnipotent. From the beginning of the biblical story of redemption, God reveals himself to be a God who is not concerned with only a small set of people in the world, but rather with all the people of the world. In fact, God’s particular election of the people of Abraham is for the universal purpose of drawing all people into the blessing of God (Gen 12:1-3). The Christian tradition has mostly missed this point in a huge way, and has instead talked about “election” as pertaining to the salvation of some instead of others. But in the biblical story, election is about a calling for the sake of others. 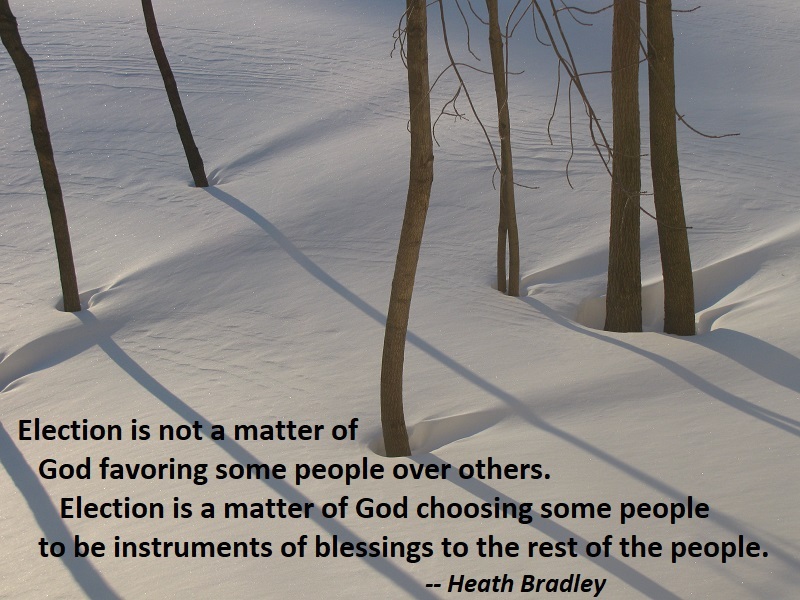 Election is not a matter of God favoring some people over others. Election is a matter of God choosing some people to be instruments of blessings to the rest of the people. It is never about God choosing some individuals for redemptive privilege, but rather it is about God choosing a group of people for missional service. Throughout Israel’s history as it is told in the Old Testament, this point is consistently overlooked, as God’s people had a tendency to think of themselves as special or immune from judgment because of their “chosen” status. The prophets were a group of people that had to continually remind the people of Israel that they were called to be instruments of divine blessing, not recipients only, and that “their” God is really the God of all people. You are currently browsing the archives for the Universalism category.